Forever officially began on Sunday with the ribbon-cutting ceremony and presentation of the new building to the community. 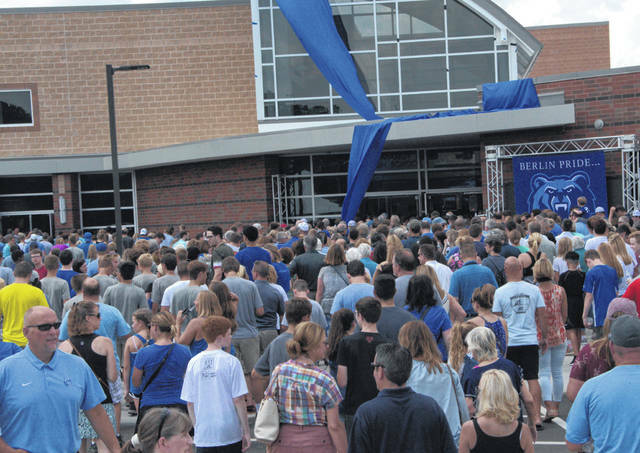 Hundreds gathered to listen to Spinner, Superintendent Mark Raiff, and Olentangy Local School District Board of Education President Mindy Patrick, among others, address the Berlin community following a parade featuring the school cheerleaders and band. The ceremony began with the raising of the school’s first American flag, which was assisted by Bonnie Cozy, who donated the land in which the school was built on. “The Star Spangled Banner,” Pledge of Allegiance, and the first rendition of the school’s alma mater followed the flag raising. Several graduates of the original Berlin High School, which opened in 1915, were on hand and received a strong applause from the crowd. The original high school existed until 1952 when OLSD was formed to consolidate the schools in the area. There will be no senior class this year at Berlin as all 2019 graduates in OLSD will stay put at their current schools. The student enrollment for the inaugural school year will be made up of 320 freshmen, 305 sophomores, and the 275 juniors who will comprise the first-ever graduating class. The vast majority of the student body will come from Olentangy High School, and the freshman class is made up of students coming from Shanahan, Berkshire and Hyatts middle schools. Twenty-nine students enrolled are new to the district. A $69.6 million budget was set for the construction, which began in June of 2016, and Spinner happily reported to the crowd the school was completed under budget, as well as on time. Funds for the school came from a March 2016 ballot measure that voters approved, which included a no-new-millage bond issue. The building sits on more than 300,000 square feet and is constructed similarly to Olentangy Orange High School, which was opened in 2008 and was previously the newest high school in the district. Mainly, the differences are related to increased security measures, but they also include state-of-the-art interactive flatscreen televisions in every classroom, a first-class media center, and student collaboration space that allows for a different type of learning environment outside of the traditional classroom. Students, teachers, and administration will officially claim their school on Wednesday, Aug. 15, when the new school year begins.